The biography of Jesus Christ is the literature of the Christian calling. Jesus told us, "Whoever believes in me will do the works I have been doing, and they will do even greater things than these." (John 14:12, NIV) During Jesus' time on earth, he lived a life of sacrifice and devotion that moves us to love and transform the world. Here at Resurrection, we are moved by Jesus to equip everyone for transformation and plant churches for revival. When Resurrection was given by God a new home for worship and mission, we were inspired by the practice of most cathedrals to create great central doors. We wanted doors that welcomed people into worship and sent them forth into the world in mission. Three Resurrection artists—Laura Tabbut, Janice Skivington Wood, and Ray Wu—worked collaboratively to chronicle our Lord's life and ministry here on earth. 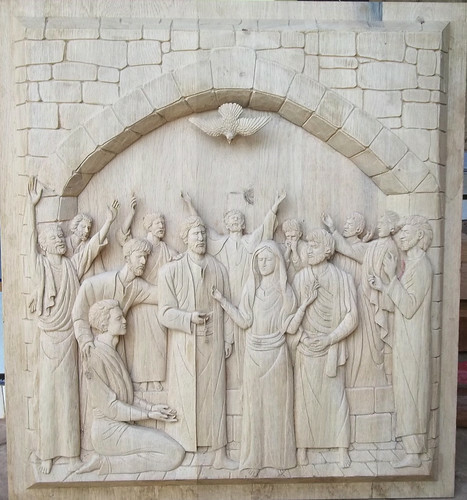 Theologically guided by our priests and worship pastor, they designed the biblical scenes that will be carved into the wooden doors. We were able to begin the carving process in February of 2015. Skilled artisans working with native woods in Indonesia are currently carving the doors. The process can take up to nine months, and even after completion, significant resources will still be needed for construction on the main entrance of the sanctuary. As additional funds are committed, we hope the doors will become a reality in the next year or two. Below are the sketches created by our Resurrection artists. Together, the left door, right door, and center arch display the Three Great Days of Maundy Thursday, Good Friday, and Easter. Together, the left door, right door, and center arch display the 7 great feasts of the church. As seen above, the center arch displays the feast of Easter. If you start at Christmas Day (left door, center panel), and move clockwise, the feasts appear in their order in the Christian year. Psalm 118:19—“Open for me the gates of the righteous; I will enter and give thanks to the Lord."